Celebrate a love that's much like the sweet kitchen staple: simple, classic, and full of possibilities. Jam, fireflies, cocktails: everything's better in a Mason jar. And, on one. This personalized plaque celebrates a love that's much like the sweet kitchen staple: simple, classic, and full of possibilities. A collective in Michigan crafts each one from recycled aluminum using a sand-casting process, adding your initials and wedding date. 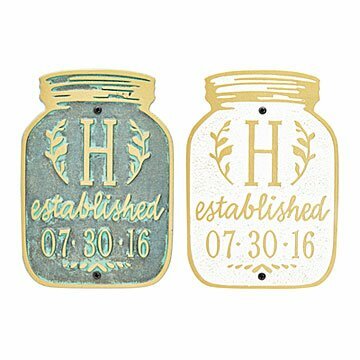 A thoughtful gift for weddings, special anniversaries, or new homes, it adds a touch of vintage charm anywhere you like to spend time with your favorite people. Handmade in Whitehall, Michigan. Arrived quickly and is great quality. Product pictured is not what you'll get!!!!! Don't expect to get the beautiful variegated green patina shown in this picture! Instead, you'll get a hideous dark hunter green paint. Customer service will tell you too bad. It's really disappointing.